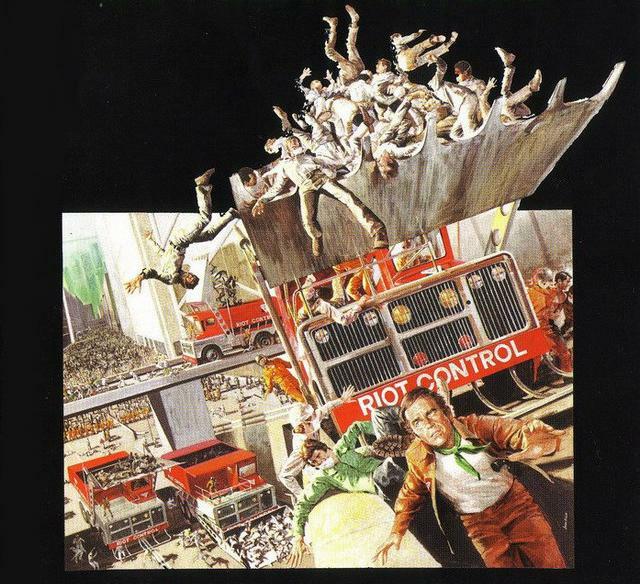 Richard Fleischer’s Soylent Green, a loose adaptation of Harry Harrison’s 1966 novel Make Room! Make Room!, is a prescient eco-science-fiction drama that earned itself cult status among science fiction fans due to its ‘shock’ climax. Released in 1973, a year after Silent Running (Douglas Trumbull) and the closely aligned but largely forgotten Z.P.G. (Zero Population Growth) (Michael Campus), Soylent Green fuses a noir-ish police procedural plot with a dystopian vision of a future world ravaged by dwindling resources, over-population, corporate corruption and environmental damage. After starring in Franklin J. Schaffner’s seminal Planet of the Apes (1968) and Boris Sagal’s The Omega Man (1971) Charlton Heston, the era’s go-to action hero, returned to the science fiction genre to star as Robert Thorn, a tough, cynical and deeply disillusioned detective in the decaying New York of 2022. Heston’s co-star Edward G. Robinson made his final screen appearance as Sol Roth, Thorn’s elderly apartment-sharing ‘book’ - a person employed to read the remaining archives of written material stored in the city to glean information of possible use in criminal investigations. Roth is the film’s heart and soul, his nostalgic yearnings for the pre-eco-meltdown world still act as a mindful warning to this day. With New York acting as a microcosm for the ills affecting the planet, Fleischer’s movie is of interest to contemporary viewers more for its enduring themes than for its actual entertainment value, as in the cold light of day it fails, much like Michael Anderson’s eco-science-fiction-based thriller Logan’s Run (1976), to fully deliver on its intriguing premise. Soylent Green is not short on narrative ambition, its plot taking in corporate-sanctioned assassination, references to ‘the greenhouse effect’, food riots, a global conspiracy, racketeering, assisted suicides and an irreparable divide between the isolated rich and the teeming, poverty-stricken masses. The scarcity of food dominates proceedings, with the common citizens (a futuristic version of the Soviet-era proletariat) reduced to surviving on the Soylent Corporation’s range of processed foodstuffs, including the titular product that Thorn’s murder investigation uncovers horrific facts about. The fetishisation of actual food is seen in the reverential manner in which black market acquisitions (lettuce, apples, beef, brandy) are treated by Thorn and Roth during a sequence in which they sit down to a ‘dinner party’ amid the squalor and cramped conditions of their apartment. That those foodstuffs have been stolen without conscience by Thorn from the luxurious apartment of the dead businessman William R. Simonson (Joseph Cotten), whose assassination is the catalyst for Thorn’s discoveries, highlights the levels of corruption and desperation running through this future society. The juxtaposition of poverty and wealth runs throughout the movie, the exclusive apartment complex (complete with concierge) stands in stark contrast to the sparse living conditions and homelessness seen elsewhere and has uncomfortable connotations, given the rise of gated communities and continued influence on political decisions wielded by big business in the modern world. It is in these comparative angles that Soylent Green has its strengths; never more so than in Sol’s assisted suicide at a government-run facility, echoes of which are felt in our society with the ongoing debate on the issue and Martin Amis’s calls for a euthanasia booth on every corner where people can end their lives with ‘a Martini and a medal’. Robinson’s death two weeks after shooting wrapped adds an extra level of poignancy to the sequence, which remains the stylistic highlight of the movie. The role of women in Soylent Green‘s vision is limited to one of two choices - either a faceless, desperate existence among the masses, or a paid role as ‘furniture’ to a rich owner, a sub-plot that the screenplay touches on via Thorn’s affair (as much about the luxury of the apartment and the food) with Shirl (Leigh Taylor-Young), Simonson’s former live-in lover, who comes with the apartment. The film was released during the era of second-wave feminism and this aspect of the narrative would have struck a powerful chord with audiences. But due to the bland, lifeless performance delivered by Taylor-Young and the perfunctory nature of the sub-plot, subsumed as it is by the conspiracy at the heart of the movie, it’s an under-explored theme. Despite its thematic relevance in the modern world, Soylent Green is only intermittently engaging and is an ultimately unsatisfactory experience, with its revelatory climax attempting, but failing to match the Statue of Liberty sequence in Planet of the Apes for shock value. The screenplay and pacing are leaden at times where a more upbeat tempo, punchier dialogue and a fuller exploration of the many narrative sub-strands could have placed the movie in genuine classic territory. The two big action sequences - a mass food riot and Thorn’s exploration of the Soylent ‘waste disposal’ plant - are adequate at best and while the scenes of over-population and squalor are relatively well-drawn the luxury dwellings, gadgets and fashions that surround the elite now look kitsch in the extreme. The outdated feel isn’t helped by an unmemorable soundtrack that veers between Americana folk and funk where it cries out for a throbbing, discordant blast of electronica to mirror and add another layer of gloom to the onscreen pessimism. As much as I generally loathe remakes, reboots and re-imaginings, Soylent Green is a film that, on paper at least, would benefit from just such an undertaking, in a manner similar to Nicholas Winding Refn’s proposed updating of Logan’s Run.